Mardi Gras or ‘Fat Tuesday’ is a celebration that livens up the season after Christmas. It is celebrated on the previous day of Ash Wednesday. The lent-period of 40 days starts on Ash Wednesday. Thereafter consumption of meat is prohibited in Christianity. So the Tuesday happens to be the last day for binge eating and revelry for a long time. So together with eating and drinking people began to have a day for general merriment. Mardi Gras carnival thus became popular in many parts of the world. The spectacular parades with dressed up participants and fantabulous floats became the in-thing on Mardi Gras. 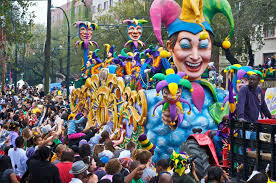 Origin of Mardi Gras is traced by some historians to some of the pagan celebrations during the pre-Christianity days. There used to be a celebration that welcomed spring season which coincided with harvesting. When Romans extended their empire, the Christianity also came with them. It was obviously difficult to annihilate the hitherto celebrated festivals. So the alternative was to fabricate Christian celebrations around the same dates. So Mardi Gras was such a festival that coincided with the pagan harvest festival. Each locality coordinating general celebrations and merriments is common in most of the French settlements like New Orleans and Louisiana in the US. That does not mean that individuals can’t have private parties. In fact, private Mardi Gras entertainments are gaining momentum. Decoration with Mardi Gras colors – The usual colors used in Mardi Gras are dark purple, dark green and gold. The venue can be decorated using streamers and fancy curtains of the same color. Artificial flowers and floral arrangements can be used to cheer up the whole venue. Use of beads of the same color can also be used for decoration. Welcoming Mardi Gras Guests – The guests can be welcomed by adorning them with Mardi Gras beads or garlands consisting of artificial flowers of the Mardi gras colors, imitating the Hawaiian custom of welcoming guests. Setting Mardi Gras party seating – Rows of small tables can be set with seats around them. Each table can be covered with clothes on one of the Mardi Gras colors. The and the chairs around it should have covers of the same color or another Mardi Gras color. This helps the host to divide the party into small groups, so that the party games can be conducted conveniently. 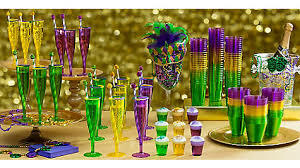 Mardi Gras table ware – The disposable ware is most convenient. The disposable plates and tumblers of Mardi Gras colors are readily available in the market. You have a variety of them with diverse designs to choose from. Mardi Gras party costumes – Mardi Gras being a colorful affair, it is only right that the guests and the host are dressed up accordingly. You can stick to Mardi Gras colors or you can decide on another themed costume. Adults and children love theme parties alike. You can use themes from fairy tales, history or even movie inspired themes. 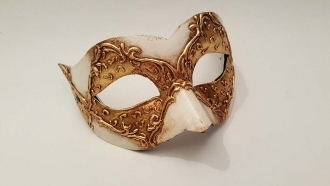 Mardi Gras masks – Masquerade parties suit Mardi Gras well, as this is an occasion for ultimate enjoyment. 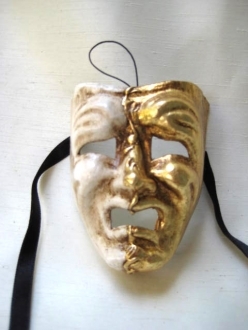 You can have theme oriented masks for the guests. It will be fun to have fairies or demons or even animals prowling in the party. 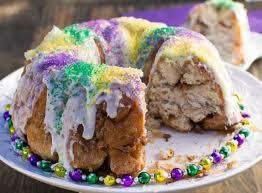 Mardi Gras food – It is good to have a king cake ready. It gives the Mardi Gras party the required élan. The mysterious plastic doll hidden in it will add to the general excitement and party mood. The other dishes can be chosen according to the taste of your crowd. 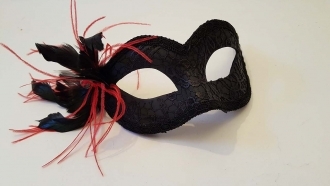 Mardi Gras party games – A party without games is very austere. Hundreds of party games are there to choose from. Choose the ones that suit your guests and the venue. Mardi Gras party venue – You can choose a park or ground for the party, if your guest list is long. It will give enough space for them to move around and some of the very elaborate party games also can be conducted. But if you guest list is short and private you can conduct the party in your own garden or back yard. Wherever it is remember to decorate the venue colorfully. Mardi Gras give-away articles – Tea cups or Coffee mugs with Mardi Gras colors can be great gifts for your guests. Small Murano glass figurines or customized water globes also can serve as excellent party gifts. This year’s Mardi Gras falls on 28th February. 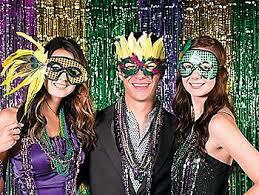 Throw a fabulous Mardi Gras party to get your dear friends and relatives together in a party mood.